Despite taking Spanish in high school and Greek in seminary, I only speak English. One day this summer, however, I’m pretty sure I understood Italian, because I know youth. Salisbury Cathedral was directly across from where we stayed during the Wesley Pilgrimage in England. Walking across the lawn, I encountered a youth group speaking another language. Photo by Joe Iovino. 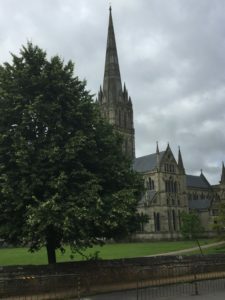 One afternoon during the two weeks I had the privilege of attending the Wesley Pilgrimage in England (I wrote several blogs about it), I was on my way to meet some fellow pilgrims at Salisbury Cathedral. It was right across the street from where we were staying. As I walked out the door, a youth group exited a building next door and headed in the same direction. As a consequence, I soon found myself literally in the middle of a youth group—the girls in front and the guys behind. This is not a position with which I am unfamiliar. In my more than 20 years in youth ministry, I have been in the middle of many groups of youth. Through the years, I witnessed and participated in countless youth conversations, but this was the first in Italian. I grew up in a half-Italian family, where on Sundays we would visit our Sicilian grandparents’ home. Occasionally, they would launch into Italian when they didn’t want us kids to understand what they were talking about. I’m fairly certain that means that if I repeated what I heard—as if I could remember it—it would be NSFW (not safe for work). I did not understand what these young people were saying, but I’m pretty sure I know what they were talking about. My experience was the key. Every so often, one of the guys would run up to one of girls—whom I’m guessing he may have had a crush on—and say something with a twinkle in his eye and a grin stretching from ear to ear. The young lady would then reply, loud enough for the whole group—which now included me—to hear, “Uno amore! Uno amore!” One love! One love! OK, I understood that. Then the whole group would laugh. Ah, this was a classic youth group conversation about dating. Well, conversation might be a strong word. They were having fun teasing one another. My guess is the guy was defending a belief that he or some hypothetical “friend” should be able to have multiple girlfriends at the same time. The young woman however disagreed. You have one love. If there is more than one, it is not amore—which is a pretty convincing argument. I tried to hide my smile, as I remembered the many times I had been in this conversation before with English-speaking youth groups. It was heartwarming to realize we human beings, despite language and cultural differences, are pretty much the same. Youth from all over the globe tease one another about dating. They laugh, smile, and use just about any excuse they can find to engage the one they are crushing on—even when it might be an ill-advised conversation topic. We are all loved with one love, by the One who is love. May we be those who love others as completely as He loves us.